A visit today to Pearl Harbour reveals nothing more than a very blue harbor and a modern cityscape jutting out of the green hills. But if we could call up the memories that lie slumbering beneath the water we would get a glimpse at an event that changed a generation. It’s important to note that before Pearl Harbour the United States was strictly isolationist. After the Crash of 1929 and the resulting depression many believed that it was necessary to ignore the international community and concentrate on fixing the problems within our own borders. World War 2 had been going on for nearly two years in Europe but the United States didn’t show any sign of joining. While Germany and Italy’s aggressions in Europe and Japan’s violent expansion in the Pacific worried many, including the pro-Britain President Roosevelt, it was an uphill battle to convince the country to go to war. The Neutrality Acts of the late 1930’s didn’t help, as they applied embargoes to any countries involved in war, no matter whether they were victims or aggressors. But the attack on Pearl Harbour changed that. On the morning of December 7, 1941 Japanese planes appeared in the skies over Hawaii, completely unexpected on that calm Sunday morning. Those over 350 planes didn’t stay for very long, but in the span of only two hours they managed to wreck a terrible devastation. 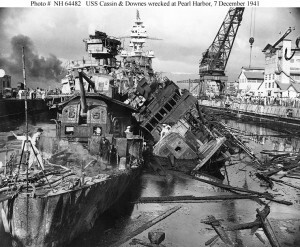 In their wake they left over 2,000 American soldiers and sailors dead, wounded another 1,000, and crippled the Pacific fleet. 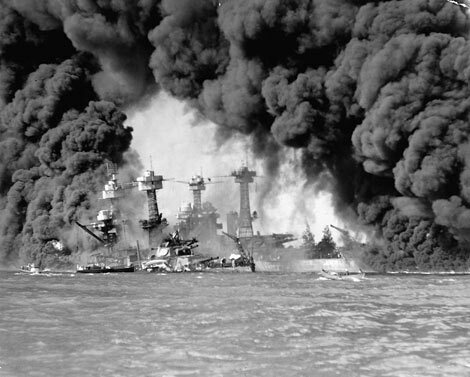 The United States lost all eight of the huge battleships stationed at Pearl Harbor, four of which were sunk. Nearly twenty naval vessels were destroyed in all, including three destroyers, three cruisers, and a mine-layer. The American people reacted in shock. Before that Sunday war had seemed like a distant thing. It was something that happened in far off France, or China, it was something that you read over in the morning newspaper and clucked your tongue at. It was a shame, but it didn’t concern the United States. Congress approved his declaration of war and within days the country was firmly embroiled in a conflict on both sides as Germany and Italy also declared war on the United States. The news and national dialogue, which had previously been almost entirely concerned with isolationism, abruptly changed course. In that one day everything changed for all of the people living in the United States. Domestic support for the war flourished while recruiting stations overflowed with volunteers. The United States had entered World War 2 and, for an entire generation, life would never be the same.